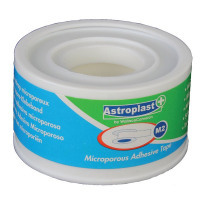 This Wallace Cameron microporous tape is designed for use with dressings for wounds and offers strong adhesion that lowers the risk of an allergic reaction or infection. The tape comes in a five-metre roll that ensures a strong and comprehensive binding of your bandage, keeping it firmly in place. The strong adhesive is specially formulated to last, helping to prevent your dressing from falling away before your wound has had time to heal.